The Gottwald lab team from left to right: Jolene Taylor, Earl Taylor, Tim Gottwald, Tim Riley, and Mary Peck. Research is conducted on citrus epidemiology/pathology to provide fundamental knowledge on epidemiology, etiology, and host-parasite interactions of exotic and domestic bacterial, viral, and fungal foliar and fruit pathogens of citrus. The long-range goal is the development of innovative disease control strategies based on sound biological and epidemiological evaluation of disease pathosystems. International cooperative research programs have been established in Argentina, China, Taiwan, Philippines, Mexico, Brazil, Costa Rica, Dominican Republic, Scotland, France, (Europe plus islands of Corsica and Reunion), Spain, Puerto Rico, and Trinidad to study the epidemiology, spread and develop control strategies for Asiatic citrus canker, citrus bacterial spot, citrus huanglongbing (greening), citrus tristeza (CTV), citrus variegated chlorosis, and plum pox virus (sharka) of Prunus sp. The two diseases with continuous research effort are citrus canker and CTV. For citrus canker, the focus is on the etiology and epidemiology of the disease in grove and dooryard situations, the interaction of local and regional weather variables with pathogen spread and disease development, survival of citrus canker bacteria on various material surfaces and under various environmental conditions and the development of improved decontamination/disease control. For CTV the present focus is on the affect of aphid vector population composition on spread and the development of sampling strategies for citrus pathogens. 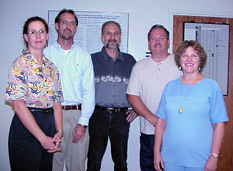 Research efforts at present are highly supportive of and cooperative with USDA, APHIS, the Florida Department of Agriculture and Consumer Services, Division of Plant Industry, the Pennsylvania Department of Agriculture, and the Central California Tristeza Eradication Agency as regulatory agencies in charge of eradication/suppression of CTV, Citrus Canker, and Plum Pox. Gottwald, T. R. and Bertrand, P. F. Patterns of diurnal and seasonal airborne spore concentrations of Fusicladium effusum and its impact on a pecan scab epidemic. Phytopathology 72:330-335. 1982. Gottwald, T. R. Factors affecting spore liberation by Cladosporium carpophilum. Phytopathology 73:1500-1505. 1983. Gottwald, T. R. and Tedders, W. L. Suppression of pecan weevil (Coleoptera: Curculionidae) populations with entomopathogenic fungi. Environ. Entomol. 12:471-474. 1983. Gottwald, T. R. and Bertrand, P. F. Effect of time of inoculation with Cladosporium caryigenum on pecan scab development and nut quality. Phytopathology 73:714-718. 1983. Gottwald, T. R. and Tedders, W. L. Colonization, transmission and longevity of Beauveria bassiana and Metarhizium anisopliae (Deuteromycotina: Hypomycetes) on pecan weevil larvae (Coleoptera: Curculionidae) in the soil. Environ. Entomol. 13:557-560. 1984. Gottwald, T. R. and Tedders, L. W. A spore and pollen trap for use on aerial remotely piloted vehicles. Phytopathology 75:801-807. 1985. Gottwald, T. R. Influence of temperature, leaf wetness period, leaf age, and spore concentration on infection of pecan leaves by conidia of Cladosporium caryigenum. Phytopathology 75:190-194. 1985. Gottwald, T. R. and Tedders, W. L. MADDSAP-1, a versatile remotely piloted vehicle for agricultural research. J. Econ. Entomol. 79:857-863. 1986. Gottwald, T. R. and Bertrand, P. F. Effects of an abbreviated pecan disease control program on pecan scab disease increase and crop yield. Plant Disease 72:27-32. 1988. Gottwald, T. R., McGuire, R. G. and Garran, S. Asiatic citrus canker: spatial and temporal spread in simulated new planting situations in Argentina. Phytopathology 78:739-745. 1988. Gottwald, T. R., Miller, C., Brlansky, R. H., Gabriel, D. W. and Civerolo, E. L. Analysis of the spatial distribution of citrus bacterial spot in a Florida citrus nursery. Plant Disease 73:297-303. 1989. Gottwald. T. R., Aubert, B. and Xue-Yaun, Z. Preliminary analysis of citrus greening (Huanglungbin) epidemics in the People's Republic of China and French Reunion Island. Phytopathology 79:687-693. 1989. Gottwald, T. R., Timmer, L. W. and McGuire, R. G. Analysis of disease progress of citrus canker in nurseries in Argentina. Phytopathology 79:1276-1283. 1989. Gottwald, T. R. and Graham, J. H. Spatial pattern analysis of epidemics of citrus bacterial spot in Florida citrus nurseries. Phytopathology 80:181-190. 1990. Graham, J. H. and Gottwald, T. R. Variation in aggressiveness of Xanthomonas campestris pv. citrumelo associated with citrus bacterial spot in Florida citrus nurseries. Phytopathology 80:190-196. 1990. Timmer, L. W., Gottwald, T. R., and Zitco, S. E. Bacterial exudation from lesions of Asiatic citrus canker and citrus bacterial spot. Plant Disease 75:192-195. 1991. Gottwald, T. R., Richie, S. M., and Campbell, C. L. LCOR2 - Spatial correlation analysis software for the personal computer. Plant Disease 76:213-215. 1992. Gottwald, T. R., Graham, J. H., and Egel, D. S. Analysis of foci of Asiatic citrus canker in a Florida citrus orchard. Plant Disease 76:389-396. 1992. Graham, J. H., and Gottwald, T. R., Riley, T. D., and Bruce, M. A. Susceptibility of citrus fruit to bacterial spot and citrus canker. Phytopathology. 82:452-457. 1992. Gottwald, T. R., Graham, J. H., and Richie, S. M. Relationship of leaf surface populations of strains of Xanthomonas campestris pv citrumelo to development of citrus bacterial spot and persistence of disease symptoms. Phytopathology 82:625-632. 1992. Gottwald, T. R., Reynolds, K. M., Campbell, C. L., and Timmer, W. L. Spatial and spatiotemporal autocorrelation analysis of citrus canker epidemics in citrus nurseries and groves in Argentina. Phytopathology 82: 843-851. 1992. Gottwald, T. R., and Graham, J. H. A device for precise and nondisruptive stomatal inoculation of leaf tissue with bacterial pathogens. Phytopathology 82: 930-935. 1992. Gottwald, T. R., Graham, J. H, Civerolo, E. L., Barrett, H. and Hearn, J. C. Differential host range reaction of citrus and citrus relatives to citrus canker and citrus bacterial spot determined by leaf mesophyll susceptibility. Plant Disease 77:1004-1009. 1993. Gottwald, T. R., Avinent, L., Llacer, G., Hermoso de Mendosa, A., and Cambra, M. Analysis of the spatial spread of sharka (plum pox virus) in apricot and peach orchards in eastern Spain. Plant Disease 79:266-278. 1995. Gottwald, T. R. Spatio-temporal analysis and isopath dynamics of citrus scab in nursery plots. Phytopathology 85:(10)1082-1092. 1995. Gottwald, T. R. and Timmer, L. W. The efficacy of windbreaks to reduce in the spread of citrus canker caused by Xanthomonas campestris pv citri. Tropical Agriculture 72:194-201. 1995. Gottwald, T. R., Cambra, M., Moreno, P. Camarasa, E., and Piquer, J. Spatial and temporal analyses of citrus tristeza in Eastern Spain. Phytopathology. 86:45-55. 1996. Hughes, G., McRoberts, N., Madden, L.V., and Gottwald, T. R. Relationships between disease incidence at two levels in a spatial hierarchy. Phytopathology 87:542-550. 1997. Gottwald, T. R., Graham, J. H., and Riley, T. D. The influence of spray adjuvants on exacerbation of citrus bacterial spot. Plant Disease 81: 1305-1310. 1997. Gottwald, T. R., Trocine, T. M., and Timmer, L. W. A computer-controlled environmental chamber for the study of aerial fungal spore release. Phytopathology 87:1078-1084. 1997. Gottwald, T. R., Garnsey, S. M. and Borb?n, J. Increase and patterns of spread of citrus tristeza virus infections in Costa Rica and the Dominican Republic in the presence of the brown citrus aphid, Toxoptera citricida. Phytopathology 88:621-636. 1998. Hughes, G., and Gottwald, T. R. Survey strategies for citrus tristeza virus disease assessment. Phytopathology 88:715-723. 1998. Pruvost, O., Gottwald, T. R., and Brocherieux, C. The effect of irrigation practices on the spatio-temporal increase of Asiatic citrus canker in simulated nursery plots in Reunion Island. European Journal of Plant Pathology 105:23-37. 1999. Timmer, L. W., Solel, Z., Gottwald, T. R., Ibanez, A. M., and Zitko, S. E. Environmental factors affecting production, release, and field populations of conidia of Alternaria spore release, the cause of brown spot of citrus. Phytopathology 88:1218-1223. 1998. Gottwald, T. R., Gibson, G., Garnsey, S. M. and Irey, M. Examination of the effect of aphid vector population composition on the spatial dynamics of citrus tristeza virus spread via stochastic modeling. Phytopathology 89: 603-608. 1999. Hughes, G., and Gottwald, T. R. Survey methods for assessment of citrus tristeza virus incidence when Toxoptera citricida is the predominant vector. Phytopathology 89:487-494. 1999. Gottwald, T. R. Practical interpretations of disease increase and spread models of citrus pathosystems. Fitopathologia Brasileira 24:228-229. 1999. Timmer, L. W., Zitko, S. E., Gottwald, T. R., and Graham, J. H. Phytophthora brown rot of citrus: Temperature and moisture effects on infection, sporangium production and dispersal. Plant Disease 84:157-163. 2000.